The Wildcats line the ice before being presented with their individual medals and region trophy. 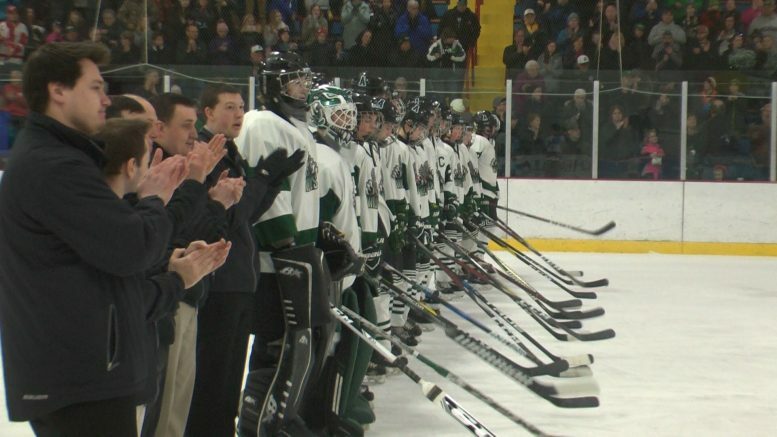 Gaylord, Mich — It’s been a remarkable season for the Alpena Wildcats hockey team. 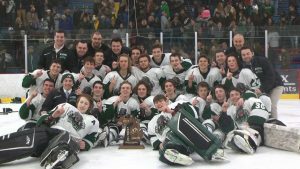 After clinching their first Big North Conference title since 2003, Alpena’s next goal was a regional title. 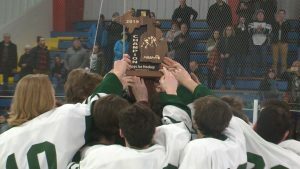 The Wildcats needed to get through the Cheboygan Chiefs before claiming the title. 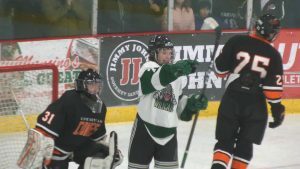 Cheboygan defeated Tawas 4-1 to get into the final game. Alpena didn’t manage to score in the first period, but they did manage the game’s tempo and controlled the puck well. The Chiefs’ attacks were either intercepted by the Wildcat defense or turned away by Cooper Black with ease. The Wildcat offense came to life in the second period. Charlie Halleck was the first Wildcat to score after following a Kyle VanDusen shot to the net. Limback was the next to score with a top shelf wrister for a two nothing lead. Colby Plowman also scored in the second period in a similar fashion to Halleck. Charlie Halleck’s strong play helped the Wildcats secure the victory against Cheboygan. VanDusen added a final goal in the third on a redirection from Halleck and through the five hole. Black was pulled with 3 minutes to go in the game with a clean sheet. It’s the first regional title for the Wildcats since 2007. They last played in a regional final in 2017, but they lost to Big Rapids in overtime. The win also ties a school record for wins in a season with 23. The Wildcats can break the school win record with a victory on Wednesday against Houghton at 7 p.m. in Sault Ste. Marie.